"The Hundredth Monkey" by Ken Keyes, Jr.
Amundsom, Ron. "Watson and the Hundredth Monkey Phenomenon," Skeptical Inquirer, Spring 1987. Possel, Markus and Ron Amundson. 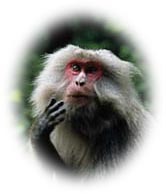 "Senior Researcher Coments on the Hundredth Monkey Phenomenon in Japan," Skeptical Inquirer, May/June 1996.